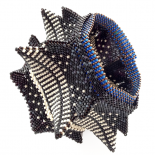 Kate McKinnon is bringing her groundbreaking open-source Contemporary Geometric Beadwork project back to MIT for the January 2016 IAP Sessions – on deck are two lectures, a seminar, and eight days of hands-on courses. Advance registration is required for the work sessions. Full schedule is here and the MIT course listings are here. The sessions are sponsored by Erik Demaine of CSAIL, whose innovative work involves computational origami, high-level solving, and computer modeling of folding, form, and deconstructed shapes, and Martin Demaine, Artist In Residence at CSAIL. 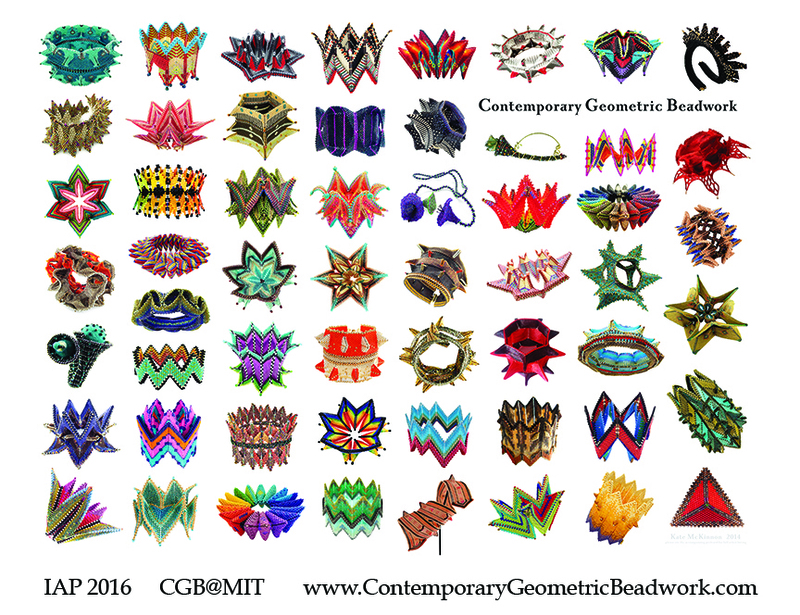 The goals of the CGB IAP sessions are to engage the MIT community in the work artistically, architecturally, and in study of form, and to get input into the creation of a beautiful new computational array to follow the clever Robotic Garden; a field of paper flowers with four colors of light that can visually represent algorithms, datasets, or flow. Also on deck for the project (and available to explore at IAP) is a series of gallery exhibitions (and the magician’s trunk that will contain them) and an entire series of pieces for a runway show. We will walk the show at (among others) Mass Art, RISD, the Savannah College of Art & Design, down the Infinite Corridor at MIT, and at the Fashion Institute of Technology in NYC. The project is open-source, and collaboration of all types is welcome.